Kala Vasudevan is a trained carnatic classical and light music singer. She is trained in Carnatic Music from Shanmukha Nanda Sabha of New Delhi under the tutelage of Shri Viswanatha Bhagawathar and later, Shri Ramamurthy Bhagawathar. Kala has won many awards in singing. An AIR artiste of Delhi from a very young age, Kala has participated in various programmes conducted by All India Radio and Delhi Doordarshan on special occasions. She won the Best classical singer award from Sangeethayan of Delhi. Kala has been performing on stage for the past several years in India, the Gulf, Switzerland and now in the US. She was awarded the title "Isai Kuyil " by the famous lyricist Shri Vairamuthu for one of her performances. Kala has conducted The Great Composers Day for several years and has also organized many programs in both classical and light music. 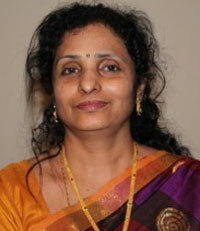 For the last several years, Kala has been a dedicated teacher of carnatic music and has also trained many students. She considers Music as Divine.